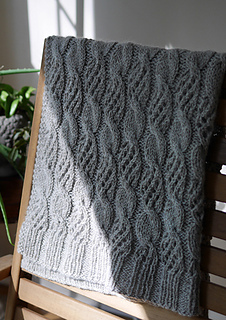 This airily delicious blanket, with its swirls of openwork and cable patterning, provides a cozy barrier between you and the cold when fall and winter winds roar. 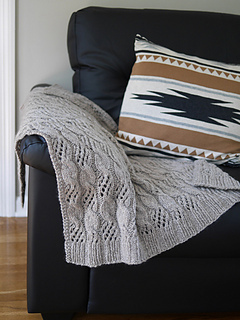 The pattern includes three sizes (lap or baby blanket/throw/coverlet), but is easily adjusted for a longer or wider piece. 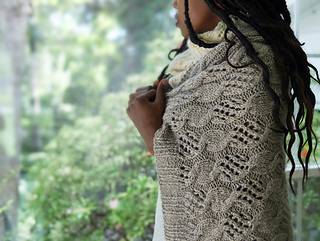 The simple pattern is very approachable for novices, especially on the larger needles used here, but also engaging and fun for experienced knitters when a quick gift or TV project is called for. 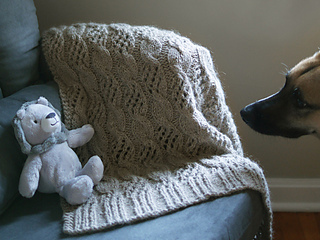 Work in a fluffy yarn as shown for a lighter-than-air result; a smoother yarn will offer more depth and stitch definition.